For the casual fisherman or the visitor wanting to try their luck we recommend Sandown or Yarmouth Pier as good options. Both piers provide easy access and fishing conditions suitable for the whole family. Sandown is the largest of the piers and can only be fished in the day time, although the pier itself is 875 feet long you can only fish from the end, which requires carrying your gear through the attractions and arcades found along its length. 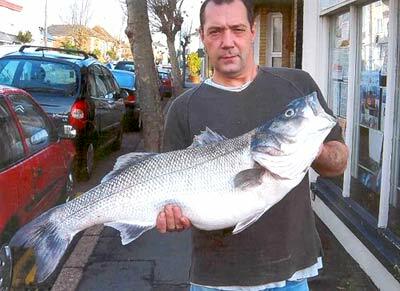 Known for its excellent bass fishing with many high double figure fish caught each year, a UK record bass was caught from Sandown Pier in 2007 weighing 19lb 12oz. Other fish from this mark include mackerel, garfish, plaice, rays and smooth hound. Steve Cave with his record bass. Yarmouth pier is far smaller but can be fished at night unlike Sandown. Flounder and mullet and school bass in harbour. Bass, smooth hound, rays, mackerel and bream from pier in summer. Notable cod venue in late autumn/winter. Note that the tide can be strong and grip leads maybe necessary. During late summer weed and spider crabs can be a pain. Chale Bay is the best beach for ray fishing on the Isle of Wight and produces thornback, blonde and small eyed rays. The mark is best fished during the day as access is via a steep cliff path. Specimen small eyed rays are taken on frozen sand eel, day or night, from late March through September especially after a storm when the sea is coloured. Other species from this mark include bass, conger and mackerel in summer. Pouting and dogfish can be a pain. A number of record fish have been taken from this stretch. The beach is of shingle with scattered rock, easily reached via path alongside Atherfield holiday camp. Fishing after dark produces bass, rays and pout to mackerel, squid and cuttle baits. Crab bait produces smooth hounds. Ragworm fished over the drying ledge to the far left of this mark produces large wrasse and bass to fish baits. Large cod in late autumn. Shallow sandy beach a favourite for bass and smooth hound with the odd ray. Brook beach is a very shallow water mark which fishes best when the sea is coloured. Other species taken from this mark are conger, bass, pout, plus cod in autumn/winter. Fishing from the pier can produce a wide variety of species, bottom fishing will account for flounder, plaice, bream, smoothound and the occasional cod. Spinning or float fishing can work well for pollack, scad and bass. The tide at Ryde recedes along way so fishing is limited to either side of high tide. There are restrictions on which parts of the pier you can fish and a permit is required. The beaches on either side of the pier are also popular marks for flounder, plaice and bass. To the east there is a long stretch of sea wall. The tide run can be strong and a grip lead is necessary to hold bottom. Further east, the shore at Seaview, provides a pleasant location to fish at high tide. The sea bed is more broken here, and a good variety of species, including flounders, eels, wrasse and some big bass can be taken, mainly on crab baits. To the west of the pier, and as far as Fishbourne, the beaches are less crowded and the sandy bottom gives way to a mixture of clay, mud, shingle and rock, fish here during spring and summer for the chance of a good sized plaice, eels and bass or during the winter and early spring for flounders. Great fishing but if you don't survey the mark at low tide expect heavy tackle losses. Ventnor consists of a series of rocky ledges and gullies best fished with a rotten bottom rig. Expect bass, conger, pout and rockling when night fishing and wrasse and mullet during the day. Pouting, bass, small pollack and few conger. Fish from middle of beach when rough. Survey at low tide, then fish after dark. Very easy access.